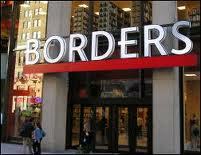 Do you have a Borders gift card? As of today, your card has just halved in value. Yesterday, Borders and Angus & Robertson fell into voluntary administration meaning that they are nearing or at bankruptcy. The administrators have announced that anyone wanting to use gift vouchers would have to pay twice the value of their gift card as well as redeeming their gift card. For example, if you have a $50 voucher, you will need to spend $150 and pay $100 in order to redeem the full value of your $50 voucher. If you think that is not very fair, you can wait a few weeks and you might not even be able to redeem your gift card at all. So if you have a Borders gift card, this is a friendly reminder to get yourself to a Borders store soon. This is also a reminder of the dangers of gift cards. If the company goes belly up, you are exposed. So, anyone stuck with a Borders card? What alternative uses can you think of for the gift cards? Better use those cards quickly. Even if you have to spend more. Once the parasitic Administrators have taken their huge fees the company will likley fold. Administrators will bleed it dry for their profit. I went today to redeem my borders voucher. A Twenty five dollar card now has zero value ! What a waste of time looking for $50 worth of books first! And am feeling bad for my son who has won it in a debate. Anyway a lesson learnt. Redeem any gift card asap.